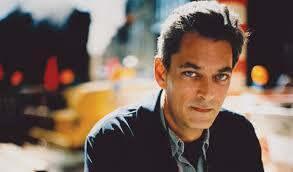 When we look at Paul Auster's eyes, we can tell that he is earnest. Although he is sometimes called a 'post-modern' author, that ambiguous term suggests that he is an ironic trickster. As it happens, Auster is not ironic. He means what he says. He claims that you do not choose to become a writer, it chooses you. He always wanted to be a writer with a capital W. He really wanted a black-and-white photograph taken of himself, with a cigaratte, a black cup of coffee, next to a typewriter and copious pages. We can ascertain this when we look at him. His eyes tell us he is earnest, as does his dress code. He sometimes wears leather jackets, but he wears typical writer's attire. This is not the expression of a trickster. When his writing becomes convoluted, when he takes us on parallel narratives and digression, that's just how it goes. No hidden message. No message about the unreality of the world. See, Auster tells us that, when he tells the story, that's where it takes him. Again, the writing chooses you. And when we look at Auster, he means what he says. It is not artifice. It is not irony. It is not meta. This is a man who really is a Writer. And we can tell when we look at his earnest eyes and his earnest way of dressing.